Last Chance Gear: Save up to 50% Off at Goal Zero. Offer Ends 7/31/17. Shop Legacy Deals Now! One of the straps has a loop where I can attach my Peak Design Capture P.O.V., so if I am walking around, I can still record whats going on around me. Perfect for bloggers or even adventurers. Learn more about the Peak Design Capture P.O.V. here. A laptop slips right into the pocket, snug and protected from other things inside the backpack. There is even a space for papers, notebooks, books, basically anything, the only difference is, it will stay slim! 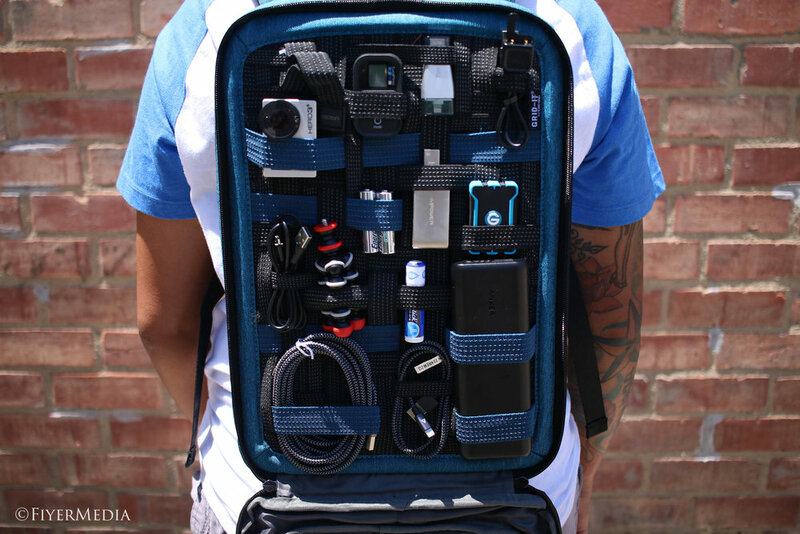 The best part of this backpack is the Grid-it section. In the front pocket, there is an organizer that will hold all of your accessories in place. No more losing your cables or flash drives at the bottom of your bag. Even with all of these things in the bag, it still remains slim! There are many different ways that you can customize this section, as the "woven elastic object retention system" can be rearranged based on your needs. If you like to travel with all of your tech, but still want to travel light, this is the solution! Comes in a variety of colors as well as different sizes for various situations. Click the button below to grab yours today!